If there was ever anymore evidence needed not to mess with alligators on the golf course, then this is most certainly it. 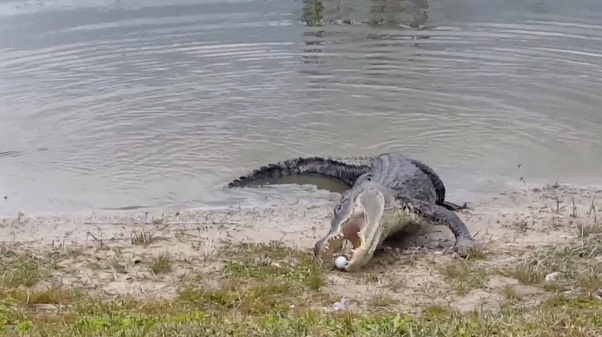 Daniel McNamara and his partner were playing the third hole at Long Marsh golf course at Rotunda West on the west coast of Florida, when they saw the alligator basking next to one of the course’s lakes. In what looks to be a deliberate experiment to see how the alligator would react, one of their balls has been thrown in its direction. But, instead of turning around and swimming off, it snapped up the ball and ate it. Watch the video below and, for the duo’s sake, lets hope it wasn’t a Pro V1. Have you experienced any weird or wonderful animal encounters when out playing either in the UK or abroad? Let us know in the ‘Comments’ section below.